The most resistant and lightest blind rivet nut ever made, created to be applied on carbon fiber sheet and composites material. 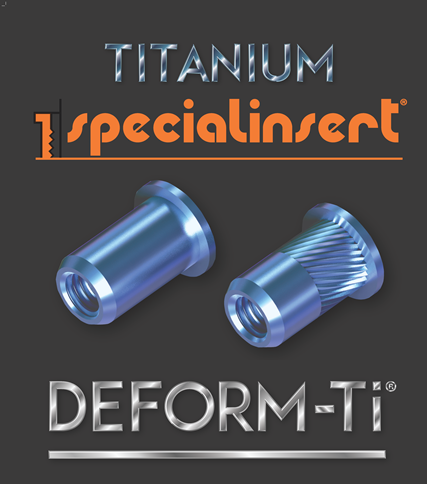 Titanium is one of the lightest and strongest material; corrosion resistant and strong as Steel but 40% lighter. 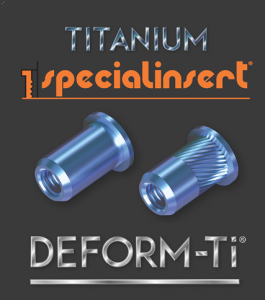 The series Deform-Nut TC/C – TFM/C is an answer to the increasing needs of the industries to reduce dimensions and weight of the final product. The threaded rivet nut can be installed on sheets or blind parts such as boxes or pipes. Easy and quick to install, it solves any problem of creating threads on thin sheets. The short series, which is reduced than the standard UNI series, is particularly indicated for application on boxes and tubes with a limited dimension available or where it is important to have the shorterst rear dimension after deformation.